A fantastic collaboration of Rodchenko's design combined with Volodia's words. I have used the names they were referred to amongst friends. That is us now in 2017. 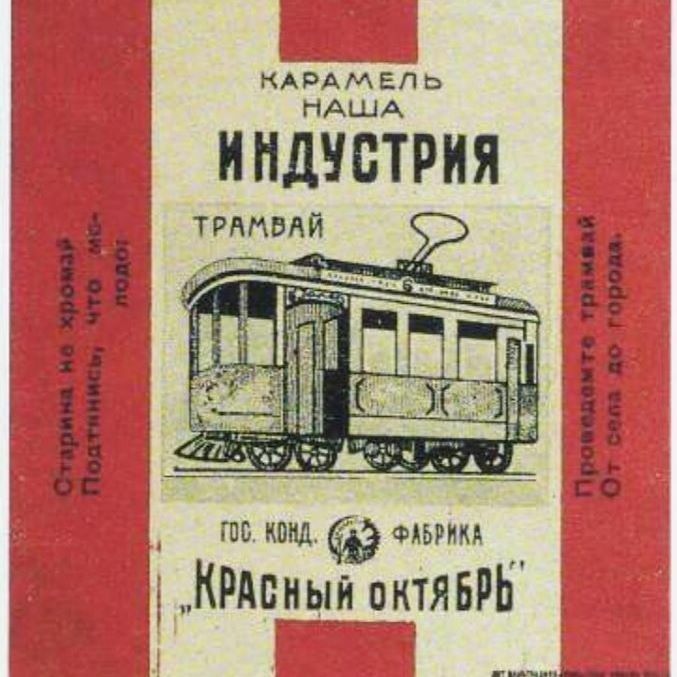 Tram■ "Old fellow don't be lame, / grab on to the new: / Lay the tram tracks / from the village to the city." ▶Train■ "Look closely at the connecting rods / pay close attention to the boiler. / Well - everywhere we should / lay the rails." ▶▶Bridge■ "Don't stand on the bank of the river / until old age. / It is better to throw a bridge / over the river." Rodchenko used an economical design with a white background overlaid by lines with a maximum of two vibrant colours. Rodchenko stayed true to the line. A black line was added to the 'Bridge.' Words and an illustration were added in black. Each caramel wrapper had a practical affirmation of addressing everyday question written by Mayakovsky. In short sharp direct language. After 8 years of continuous war, the affirmations to build a bridge sought to mobilise for the rebuild of the devasted Soviet Union. Not fake news. Reality. Connecting.